What are the three words that can make you feel on the top of the world? Absolutely Divine Pizza! Upon entering the bustling bazar of the city of Leh, I see it from the window of our car, a chalkboard outside of a restaurant that says “Absolutely Divine Pizza”. I am ‘absolutely’ thrilled. My love for pizza extends beyond the concept of time and space. I will come back and find it. More than the craving, it’s the promise that has me hooked. No one has, this blatantly, marketed their pizza as being absolutely divine. It deserves to be eaten, but maybe later. A week on the road and a more than a week to go, our bodies need rest to tackle the highs of Nubra, Pangong and more. Bikamp Adventures, a campsite away from the city buzz, about 20 kilometres from Leh, in the greener side of Ladakh is our home for the next three nights. The day, bright and shiny, begins with an excursion to the spiritual centre of Ladakh’s Drukpa Buddhists. Hemis Monastery, or Hemis Gompa, as it is locally referred to. Unlike other Ladakhi monasteries, say Thiksey or Chemrey, which are tall standing structures neatly stacked on top of conical hills, and are visible even from a distance; Hemis is hidden in plain sight amidst red, rocky mountains. Its entrance at once reminds me of Greek architecture, whitewashed and donned with flowers. So does its inside-exterior, which is preceded by a big, central courtyard. It looks like a walled-city, Vatican comes to my mind. We set out, each to his or her own accord, taking it all in. There’s crowd but peace is not eluded. While the prayer hall, with its 8-metre high idol of Padmasambhava, calms us down, Hemis’ extensive museum with a collection of pictures, documents, weaponry, utensils, tiger-skin and what not, stirs up a thousand emotions. Photography is not allowed inside the museum; you need to deposit your phones and cameras inside the locker. The museum also hosts a big souvenir shop with a lot of books and small items. A few of us bought a few things and then headed back to Leh for lunch at Zostel. If ruins could speak, Leh Palace would sing. Or rather, lament. The one, who has, over the course of a few hundred years, has overseen Leh transform from being a distant cousin to Tibet into the bustling city that has tickled the fancy of many a traveller, now lies in ruins. Bearing a casual resemblance to the Potala Palace in Lhasa, Leh Palace is small architectural feat. This 17th-century, now abandoned, 9-storied marvel hosts a few exhibition rooms and a terrace that gives, undoubtedly, the best view of the sprawling city laced with crumbling chortens, mudbrick homes, monasteries and mosques, and the mighty Stok range. The palace has been as intriguing as the walk to get here, through the winding lanes of the Old Town; I come to understand what the fuss is about. And why it’s all too easy to fall, head over heels, in love with Leh. These are alleyways with small bakery shops on either side. The smell of freshly baked bread is enticing, reminiscent of the streets of Kashmir. We try one with the stuffing of meat. It’s an absolute smacker. Sadly, my stomach is bearing the weight of the recent lunch and I have a hill-palace to reach. Leh City as seen from Leh Palace. The rest of the evening is spent wandering about the beautiful, clean Leh Market, exploring and simultaneously looking for a certain Absolutely Divine Pizza, but the divinity eludes me. After lazing around through half of the day: taking a few dips in the stream half a kilometre from Bikamp, playing a sport or two, and then playing dead near another stream post lunch, we pick ourselves up, without dusting off the tardiness and head towards Thiksey. It is one of Ladakh’s most recognisable monasteries, raised from the rock up in pure Tibetan style. The prayer hall is atmospheric, with a tall idol of Maitreya Buddha that looks part amused and part, well, irritated to see us. The view from the terrace is splendid, as expected. The sun is about to set and we’re headed to Shanti Stupa, perched atop a rocky ridge behind and above Leh. It was built by Japanese monks between 1983 and 1991 to promote world peace, which is ironic because it is way too crowded and the tourists here are anything but quiet. What is does offer is a breathtaking view of the Leh town. Taking a few pictures, we return to the market. I have a pizza to find and a bookshop slash coffee shop to be in: Gulshan Books, The Coffee Shop (it has another branch in Srinagar). While the former is still able to evade me, the latter turns out to be a heart-warming experience. The owner is from Srinagar and we immediately strike up a conversation. He tells me how media is presenting Kashmiris in a bad light. Having returned from Kashmir just a few days ago, happy and elated, I empathise. Browsing through hundreds of books and coffee and cookies later, I buy one on his recommendation and we return to Bikamp. Tomorrow we head to Nubra! The drive through the ancient Silk Route is not so smooth. Pun intended. Khardung La stands in the way. Going is slow. Even before leaving Leh, I’m feeling a bit breathless and woozy. Our bikes are being serviced at the Royal Enfield service station, a few kilometres from the centre on the Manali-Leh Highway. I think more than anything else, it’s the waiting, the hype that has piled up over the years and is now reaching a crescendo. I know it’s not the highest motorable road in the world. And I’ve been just fine on all the passes that came before it. With that feeling we set out. It’s well-past noon. I’m hoping for the best. A little before South Pullu, light-headedness comes into play. There’s no sign of vegetation. Oxygen is diminishing with every passing mile. The only thing that is helping me snap out of dizziness is water, plenty of it, every few minutes. Even our car seems to grasping for breath. It’s the Land of High Passes for a reason. Khardung La is here, arid and cold. Too many have queued up to take a picture with the legendary milestone. I take one from a distance. Too much physical effort is not advised unless you’re a pro. Everybody is walking like George Romero’s slow-moving zombies. There is emergency oxygen available at the medical hut for those can’t do without. All of us seem to be fine that way. And after taking a few pictures, set out again. Light-headedness hasn’t subsided and is made worse by a passing Indian Army convoy that has stopped us dead in our track a little before North Pullu. Even the roads seem to have taken a turn for the worst. They are in very bad condition to say the least, till Khardung. After which things start to get a little normal, both in terms of roads and health. It’s around Khalsar that the vastness of Nubra Valley draws out your ‘wow’ by punching you in the gut. Lovingly, of course. It’s a sight to behold. We are here. Nubra, India’s northernmost region, is packed between Pakistan, Tibet and China and is comprised of two valleys, Nubra and Shyok. Both of these rivers rise from the glacial peaks of the Karakoram Range and merge near Diskit, after which the river is solely known as Shyok. The huge mountains may give an illusion of impenetrability, but generations of local communities have bloomed through Trans-Himalayan trade up until the very 50s. The Silk Route, as it is popularly known. What is now traversed on 4x4s and its smaller siblings was once treaded through double-humpback riding on the Bactrian Camels. The dune-like stretch can be seen from before Diskit, which is where we’re headed. Turtuk, a village (of Balti speaking people) within a breathing distance from Pakistan’s Baltistan region has recently been opened to the tourists. Sadly, we’re behind schedule and will have to give this one (a part of Pakistan till the 1971 war put it in India) a skip. A beautiful evening and the subsequent morning awaits us on the Hunder Dunes. A sunset is the sun’s fiery kiss to the night, said Crystal Woods. And we reached just in time to see the sun’s ceremonial procession wherein every element in nature played its part to perfection. It would not be overselling it to say you can see all the pictures there are to see, but nothing can prepare you for when you see it with your own eyes. That jaw is going to drop! 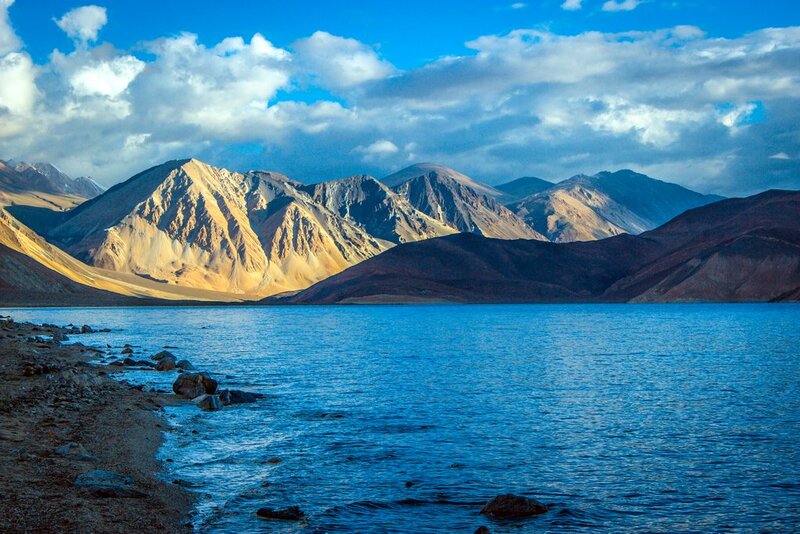 Pangong Tso, in Tibetan which means “High Grassland Lake”, stretches to about 140 kilometres from India to China. Only one-third of it lies in India. To me, it looked like a small-scale oceanic ecosystem minus the aquatic life, with miniature high tides showing up as the night fell. At both times, the evening we reached and the next morning, it showcased its vivid blues that changed shades every passing minute. A striking interplay of contrast and light! If ever nature imitated playing Beethoven Symphonies, this would be it. But getting here has been one hell of a nightmare, especially from Nubra. A few kilometres after Khalsar and the roads turn into a trail of rock ‘n’ dirt. A few pagal naalas await your arrival with, sometimes, devious intentions. We were welcomed by one that led to the clutch of one of our bikes giving away. Thankfully, a local who was travelling with a mechanic came to our rescue. Make sure you leave as early as possible to give yourself enough time to execute a Plan B in case you are struck down by the force of a fit-throwing stream or the mischievous roads. What else do I say or write about a place that has every year, more riders flocking to it than the migratory birds heading south? Is it worth the effort? Absolutely! Is there a need to establish some ground rules? Yes. And right now would be a good time as any. There is an alternate route from Nubra to Pangong Tso via Wari La but it is longer of the two and adds 4-5 hours more to your time. Pangong Tso to Leh feels like a breeze as compared to the drive the day before. It’s still treacherous, don’t tread it lightly. Chang La, higher in altitude than Khardung La lies in between. While Khardung La had me reaching for water every 5 minutes for a few ounces of oxygen, Chang La didn’t seem that oxygen-devoid. Rather, it didn’t feel so. Maybe I was properly hydrated this time around and had a good night’s sleep. However, the gorges on the way to it seemed more threatening than Khardung La. Nonetheless, we reached Leh within 5 hours with no (mis)adventures in between. In the evening we set out again for souvenir hunting in the Leh Market. In the meanwhile, my hunt for the Absolutely Divine Pizza was on. I think, in the course of three evenings in Leh, I circled the market around 6 times in search of, you know. Was I hallucinating at the time I saw the chalkboard or did the restaurant owner simply decide to play a cruel joke by hiding the chalkboard? I am heartbroken, but also hungry. We settle for the Il Forno restaurant in Leh and I order a Bolognese Pasta instead, while everybody munches on pizza. I refuse. Their menu doesn’t say it’s absolutely divine. Sometime soon, I’ll come back to Leh. I will find it. And I will eat it. This was just not my time. Sadly! Amazing! I wish I could visit Leh right now. Your writing is so lively. Have you covered all of this place? Any plans to visit again? 😉 Although all of your pictures are super cool but I liked the library one the most. That is of my interest you know 😉 Keep writing! Lovely pictures and beautiful write up Mohit .